Verni-bafi (literally meaning Verni-weaving) is a unique art of northwestern Iran. This artistic activity is quite popular among women of the region, especially Arasbaran. Some 85 percent of nomads of East Azarbaijan province are active in weaving Verni. However, this Iranian handicraft is more prevalent among nomads and some villages of Arasbaran region. In fact, Verni-bafi is a source of livelihood for over 20,000 residents of Arasbaran region, Mehr News Agency reported. With a population of over 400,000, Arasbaran is situated in the northeast of East Azarbaijan province. It is widely produced by nomads of Shahsavan and in Ahar, Kalibar, Khoda-Afarin, Hourand and Varzaqan. At present, Iran is the only exporter of this product in the world. Verni shares the features of both kilim (handmade nomadic carpet) and rugs. It is woven without any prepared pattern by the nomadic women and villagers of Arasbaran. The weft of Verni is made of cotton, wool and silk threads. It is woven both on horizontal and vertical looms, and used in tents and houses of villagers and nomads. Verni’s patterns reflect the region’s beliefs and traditions. Imaginative designs and images of animals and birds are used in weaving Verni. Colors such as cream, light blue and white are mainly utilized in Verni, which is produced in a variety of sizes. The regional people procure their raw materials from local and non-local middlemen, and then give the woven Verni to supplier of raw materials against a wage. Verni is mostly woven by the nomadic women when they migrate in winter. This is why most patterns and colors of Verni reflect the nomadic culture, beliefs and spirits. The main hub of Verni-bafi is the nomadic region of East Azarbaijan province from where this art form has spread to other regions. Arasbaran’s Verni is a suitable product for boosting the province’s non-oil exports. Offering low-profit bank facilities, supplying raw materials at reasonable rates and guaranteeing the purchase of their product can help increase the income of nomads and generate jobs. At least two people in any nomadic family are engaged in Verni-bafi. Based on the results of a field study, every year over 14,000 pieces of Verni are produced in different sizes and presented to domestic and foreign markets. Of this figure, 30 percent are sold in the domestic market and the rest is exported to European, Asian and Persian Gulf states. Verni is neither a carpet nor a kilim, but rather a floor covering that is as simple as kilim and has the exquisiteness and beauty of a carpet. Since no knots are used in weaving Verni, it is similar to kilim and has a carpet’s design and appearance. It is also used by Moghan’s Shahsavan nomads for carrying their belongings during the winter migration. 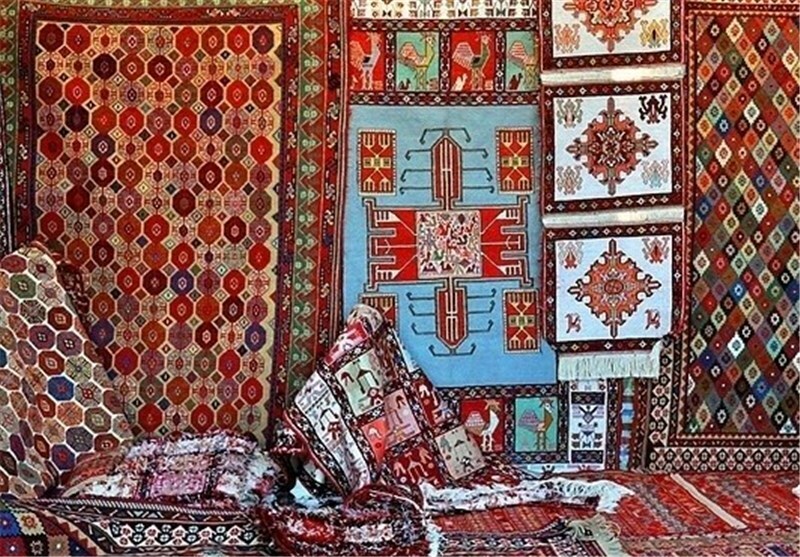 Most patterns of Verni produced in Arasbaran region contain figures of animals. These include deer, rooster, cat, snake, birds, gazelle, sheep, camel, wolf and eagle. Verni is typically woven in the same room where the nomadic tribes reside. Known for its diligent nomadic craftsmen, Arasbaran is an important center for safeguarding the authentic and indigenous handicraft. However, without the support of the government and suitable facilities, these artistic activities will not flourish. Handicraft experts maintain that one way to support Verni-bafi is by providing long-term and low-profit banking facilities to craftsmen active in this sector. Another measure for supporting this artistic activity can be honoring Verni weavers on official occasions.